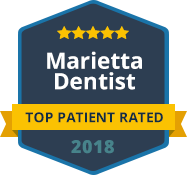 If you have lost one or more teeth, there are a few different options you can choose from when you are a patient at our clinic in Marietta. We have dental bridges that can replace one or two teeth without surgery but still offer a permanent, fixed solution. Many people prefer the natural appearance and function of dental implants for individual tooth replacement. We also have partial dentures for an affordable option for those on a restricted budget or who are not good candidates for dental implants. When you lose all or most of your teeth, it can have a dramatic effect on your life. Complete dental restorations can give you back your smile and confidence. We have dental implants and complete dentures to replace full sets of teeth for a healthy smile for our patients. You deserve the benefits of a complete smile for a lifetime. If you have lost some or most of your teeth, come see our restorative dental experts at Dental Care Center at Kennestone. We can help you regain a beautiful, functional smile again. Our office has payment options available, and we accept multiple forms of dental insurance. Contact us today to schedule your consultation.